I know I need to get caught up on my movies, so one thing I can do is look for any films that may already be on DVD, like The Lone Ranger. Which is where we come in now. The only problem is that the film has a 30% on RottenTomatoes and was nominated for five Razzie awards. Let’s take a closer look. I would imagine most of you know the basic setup. 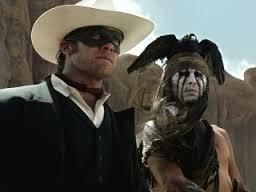 So Armie Hammer is the Lone Ranger, Johnny Depp is Tonto, and Bill Cosby is awesome. Let’s just cut to the chase, shall we. So, The Lone Ranger. Everybody hates it. I was all prepared to hate it, too. And… I don’t get it. This film was good. Not a masterpiece, mind you. But it doesn’t deserve all of the bad rep it continues to have. True, there are negative aspects in this film. There are a few dirty jokes. Armie Hammer is kinda bland. It’s not always very consistent. But it seems to me that the big issue here is the fact that the film was marketed as a kids film. It’s not. Don’t get me wrong, it’s not Wolf Of Wall Street adult. Think Indiana Jones, that level of adult. Now, there’s also the fact that it’s very long. People criticize this film for being too long. And yet, even though I constantly berate films for length, I’m actually fine with this film’s length. Every scene seems to be crucial to the story. There was nothing that I thought could have been cut. While there are some jokes that felt out of place, there are a lot of scenes that I felt worked. One of my favorite moments was when Armie Hammer’s nephew found out who survived the ambush. I also like the climax, when all my inner male fanboy went crazy with excitement. Now I don’t understand why Depp is nominated for Worst Actor at the Razzies. You can tell that this role means a lot to him, and he’s clearly trying his hardest. (Not Best Actor worthy, but he is good) The other actors do a good job, though no one really shines. In fact, if there is a star in this movie, it’s the production design. I mean, the sets in this movie are truly something to behold. Top it all off with some impressive effects and pretty amazing makeup, and you get one of the more underrated films of the year. I don’t really understand how most people dislike the film. It may be flawed, but I liked it fine. I think the general public need to be more open to films of a longer run time, and more willing to let a director take them on a ride.